“The Walls Are Rising” — SEEN! The AIA Dallas screening last night of “The Walls Are Rising,” a 1967 film made by the AIA about Dallas’ somewhat chaotic urban planning, was a huge success! Not only were there upwards of 250 people in attendance at the Sixth Floor Museum to view the film and listen to a panel discussion afterwards, but, for me, it was something of a surreal experience to have a large group of people discussing a film I had researched and researched but had been unable to find any trace of after 1972. I contacted the Dallas Chapter of the American Institute of Architects with my “re-discovery,” and they enthusiastically set out to find it. Thanks to AIA Dallas’ Anna Procter, the film was found and digitized. 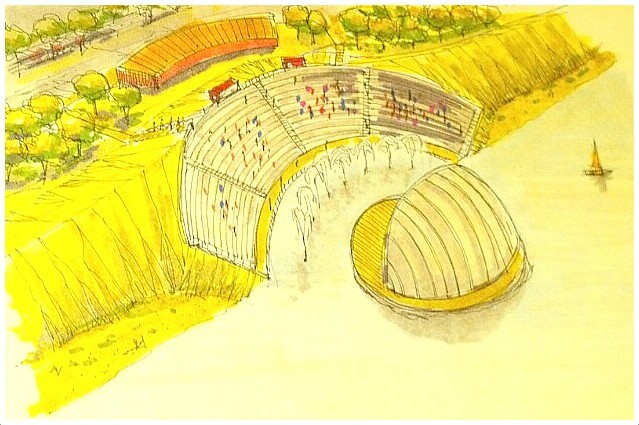 Other related archival materials were also found, including a wonderful series of drawings, one of which (above) shows one of the many grand and occasionally outrageous visions for a new Trinity River Town Lake: an amphitheater facing a bandshell set IN the water, replete with the ubiquitous sailboat that always seems to accompany renderings of just about every view of Trinity development I’ve ever seen. I would love to see this series of drawings collected in a book. I would buy it. I loved the film. It was weird and kooky and definitely of its time. It’s interesting to see how the city has improved in the past 40-something years, but it’s also frustrating to see how LITTLE it’s changed. The film will be available in the near future for online viewing, which is great, because not only will more people be able to see it, but also because we’ll all be able to pause it to look more closely at some of the many, many photos used in the film. UPDATE: Watch the film online, here. Thanks to AIA Dallas/Dallas Center for Architecture, panelists Howard Parker, Larry Good, and Jack Gosnell, moderator Robert Wilonsky, and the Sixth Floor Museum for an entertaining night. And thanks to everyone who attended! this is a city for builders has always been such, while it is not a city for the long term landmark that is the reason is is a city of the moment and has too be that way, it is a complex thinking we have too observe and protect…. Thanks, Fred! I’ll post a link to the film when I know of one. This toll road is exposing alot of things as of recent, it shows what a bunch of suckers run our city and government and the things they propose and pass as sane…..
.you see I get all of this visual learning from the late 1950’s when that was going too become the first Arts District area in Dallas, by Lee Park in an area with lots of trees and now freeways and it failed, lost of money was spent…..
.reading the Raul Askew Morning Columns back then, Dallas was going to be on its way then.,hiring snoody people to landscaper your bathroom does not make a world class city it makes a world class bathroom…..